The Third Annual Rim Of the World Historical Society’s Apple Festival and BBQ is being held this year at Pinecrest Conference Center in Twin Peaks in the San Bernardino Mountaines on October 5th between noon and 5:00 PM. This is a perfect place for it, as back in the 1930’s “Doc” Baylis planted the finest of fruit trees there, including dozens of apple trees. 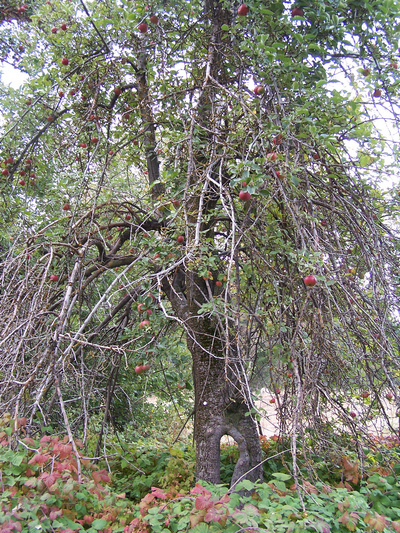 Some of these old timers are still around like the hollow fella above, and still produce wonderful apples. The Mill Creek Boys will provide music for square dancing, and western dress is encouraged. The conference center itself is a gem and very gracious hosts. Tickets for the event, that will showcase an apple dessert contest, are $25 for Historical Society members and $30 for non-members. Children 12 and under are $10. Procees to toward supporting the Historical Society, and is their main fundraising event. Mountain Icon J. Putnam Henck, former owner of Santa’s Village, will be there as well. Call (909) 336-1082 for ticket information and reservations. For membership information visit the Historical Society online at http://www.rimoftheworldhistory.com. 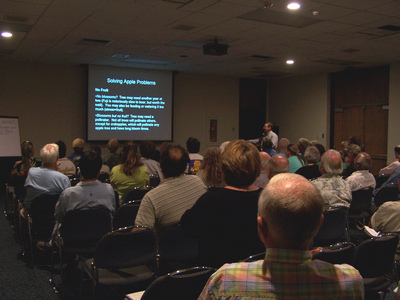 I was a speaker at the California Rare Fruit Grower’s Festival of Fruit held at Cal State Fullerton this weekend. I wanted to thank them for being gracious hosts first of all, and what an entheusiastic group! I felt like a rock star, and the audience was “oohing and aahing” during my presentation, and even broke out in cheers when I showed what apples fruited. We sat in on other speakers, getting useful information on growing avocados (which I can’t eat but my wife loves). They had a bunch of obscure tropical fruit trees for sale in the parking lot and a tasting table with lots of fruit. There were a bunch of fruit geeks (and if you’re reading this, you are a fruit geek) walking around with blissful expressions on their face, and rightly so as the festival was well done. My compliments to the Orange County chapter for being gracious and organized hosts. For the second year in a row and despits a savage borer attack, Melrose was quite decent for us, which puts it on our “Great for Southern California list. A crisp, sweet, dense, spicy apple that holds up to the heat; what more could you ask? 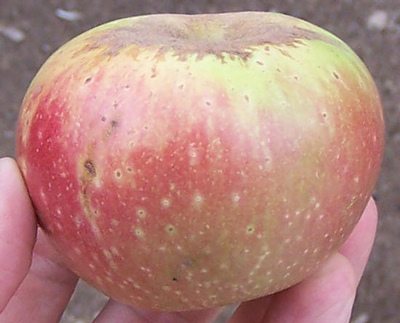 OK, you could ask for some beauty, as the apple is dog-ugly, but we’re all about taste here, and biting into one of these makes you forget the ugly exterior. 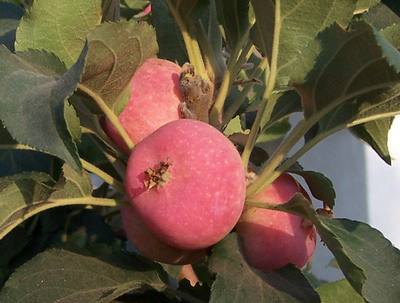 Rescue Crabapple is a study in amazing adaptability; it hails from the prairies and is considered hardy to USDA Zone 2 (40 to 50 degrees below zero) and yet fruits just fine here in Zone 10a. I couldn’t find much background information on it, other than on its own roots it gets huge and is occasionally grafted onto Dolgo rootstock. It bursts forth with cascades of white flowers in the spring and bears grape-like clusters of pretty pink and yellow fruit. The apples are sweet without a bit of the usual crab-like tang, and are best enjoyed not quite ripe, as they can be mushy. Like most crabs it bears reliable crops here and is tested OK for Southern California. If it seems there’s been a lag between apple posts, its been because I’ve had a distraction going on. I actually have a profitable hobby selling plans for teardrop camping trailers (which I neglect for my unprofitable hobby of messing with apples). I’m putting the finishing touches on my third model, a replica of a 1954 Benroy trailer, originally built by Bennet Petersen in Glendale, California. 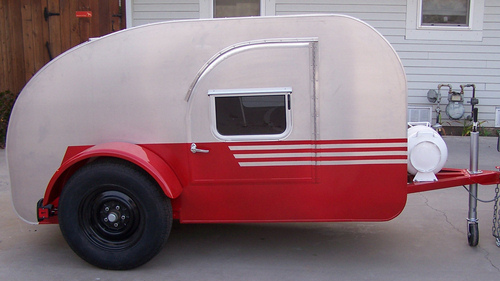 I will now use this prototype to draw a detailed set of plans and narrative on how to build your own teardrop. We’ve sold thousands of plans all over the world for our other two models, the Cubby and the Comet. Before you decide this is something you’d like to build, I should warn you that even with our detailed plans, it is no easy beginner project; in fact, it was the toughest of the three teardrops I’ve built. But its classic lines and style are extremely popular and we already have had many inquiries about when it will be complete. Bennet Petersen is still alive and we’re taking it up to see him at the end of the month, and the plans should be ready by next spring. And no, the prototype is not for sale (sorry).